A bill that could have prohibited the payment of incentives for doctors participating in market research studies sponsored by pharmaceutical companies has been defeated in Philadelphia's City Council, after inputs from the Insights Association and locally-based business leaders. Bill No. 180888 passed through committee in the fall and aimed to prohibit many payments from pharmaceutical manufacturers and their agents to health care practitioners, likely including incentives for MR studies even where conducted by independent research companies, with sponsoring manufacturers not aware of who participated. 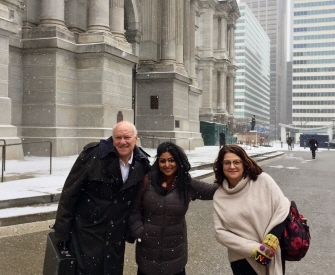 Following up earlier meetings with council members the Association, joined by Howard Schlesinger of Schlesinger Associates, Roni DasGupta of M3 Global Research and Ileen Branderbit of Focus Pointe Global (pictured), met with Councilman Allan Domb on February 1st to discuss the potential impact of the legislation on Philadelphia-based MR and analytics businesses. The Council voted down the Bill by 9 votes to 5 on February 7th. The association and its predecessors have secured similar results in the past in Massachusetts, the District of Columbia, Minnesota, California and New Jersey, as well as the federal Physician Payments Sunshine Act. The Association's VP Advocacy Howard Fienberg said of the latest win: 'We understand and appreciate Philadelphia's concerns about opioid abuse, but banning or restricting respondent incentives for health care practitioners - payments that solely encourage participation in research by a highly important and difficult to reach community - would not help curtail the opioid crisis'.